The Japan Air-Self Defense Force (JASDF) had to dispatch its fighter jets 571 times during fiscal year 2015 to intercept Chinese military aircraft approaching or intruding Japanese airspace, Japan’s Defense Ministry revealed, according to The Japan Times. This number constitutes an all-time high since the defense ministry’s Joint Staff Office began to keep records in fiscal year 2001 and also marks a significant increase from 2014 with 464 sorties. Japan’s fiscal year ends in March. The JASDF has recorded the most Chinese activity in the East China Sea around a group of uninhabited islands there, known in Japan as the Senkakus and in China as the Diaoyus and claimed by both countries. The JASDF Southwestern Composite Air Division also reported an increasing Chinese presence between the islands of Okinawa and Miyako. The JASDF recently stood up a new air wing consisting of Mitsubishi F-15J all-weather air superiority fighters at Naha Air Base, located in the capital city of Okinawa, to counter Chinese intrusions. The 9th Air Wing consists of 40 F-15J fighter jets. 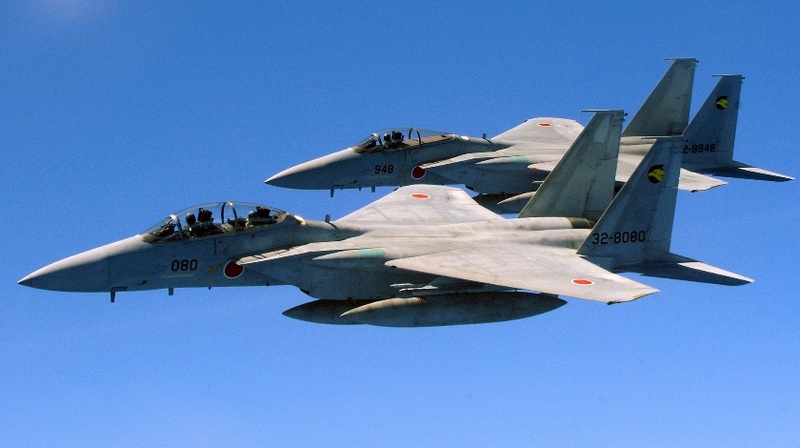 The stationing of additional fighter jets is part of Tokyo’s efforts to enhance the defenses of the Ryukyu Islands chain (known in Japanese as the Nansei islands), which stretches southwest from Kyushu to Taiwan. The push comes amidst China’s growing assertiveness and military presence in the East China Sea. Japan currently fields around 215 F-15J (including the upgraded F-15DJ/F-15J Kai versions) all-weather air superiority fighters built under license by Japanese defense contractor Mitsubishi Heavy Industries. However, despite modernization efforts, there have been concerns that the F-15J, first introduced in the JASDF in 1981, is no longer adequate to deter the PLAAF. “The numbers of scrambles alone do not tell the whole story, but we should recognize that the increase… indicates a tougher security environment,” a Japan Self Defense Force (JSDF) spokesperson said last week, according to The Japan Times. Interestingly, while the number of sorties targeting Chinese aircraft has increased, the JASDF saw a decline in the number of times it had to dispatch fighter jets to intercept Russian planes. “There have been 873 overall sorties in fiscal 2015, with 288 targeting Russian aircraft. In the previous fiscal year, Japan scrambled jets 943 times, 473 of which were in response to Russian incursions,” according to Stars and Stripes.